A limited/numbered deluxe edition from The Folio Society, London. Published in 2002. Few authors have created a fictional world as fully realized as J.R.R. Tolkien's Middle-earth. 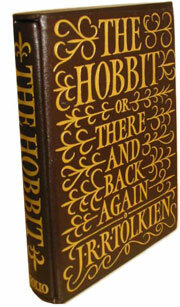 Comprised of The Lord of the Rings trilogy (The Fellowship of the Ring, The Two Towers, and The Return of the King), The Hobbit, and The Silmarillion (published posthumously), the Middle-earth novels include detailed maps, languages, histories, songs, flora, and fauna to support their myriad characters and creatures. Tolkien was born John Ronald Reuel Tolkien in 1892 in South Africa, but moved to England at age three, where he was tutored by his mother. 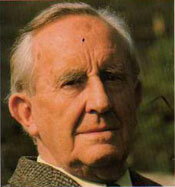 Much of his studies focused on the biology of plants and animals, the fascination with which can be seen throughout much of Tolkien's writing. Many elements of Tolkien's fantasy realm are attributable to experiences in his own life; many of Bilbo Baggins' walking adventures in The Hobbit were largely inspired by a trip to Switzerland, and the beautiful half-elven character of Arwen from The Lord of the Rings is said to be based on Tolkien's wife, Edith. Tolkien's passion for words and writing began in earnest after World War I, when he took a job at the Oxford English Dictionary. Soon after, he became a professor at the University of Leeds, working with early and Middle English texts such as Beowulf and Sir Gawain and the Green Knight. Much of his work involved translation of texts, and it is likely his etymological background and the close study of words necessary for translation that leant authenticity to the languages in his books. While many fantasy authors are successful, few have achieved the iconic status of Tolkien. Fans and collectors come from all over the globe and are not limited to those who normally lean towards the science fiction/fantasy genres - many readers with a wide variety of literary tastes have fallen in love with Middle-earth. Tolkien died in 1973 at age 81, but with each new generation of readers, the magic of his world is discovered through fresh eyes.